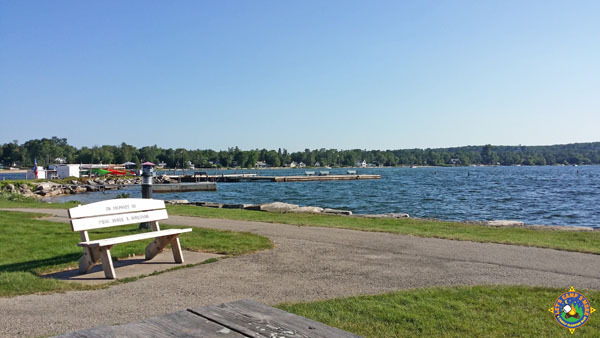 Come enjoy the best part of Door County with this Peninsula State Park review by Let’s Camp S’more reader, Steve R.
My wife and I vacationed in the upper-Peninsula of Michigan where it’s in the 70s during the day and 50s at night. Perfect—if you don’t mind wearing a sweater in July; not so perfect if you want to lay out on a sandy beach or enjoy an ice cream cone. 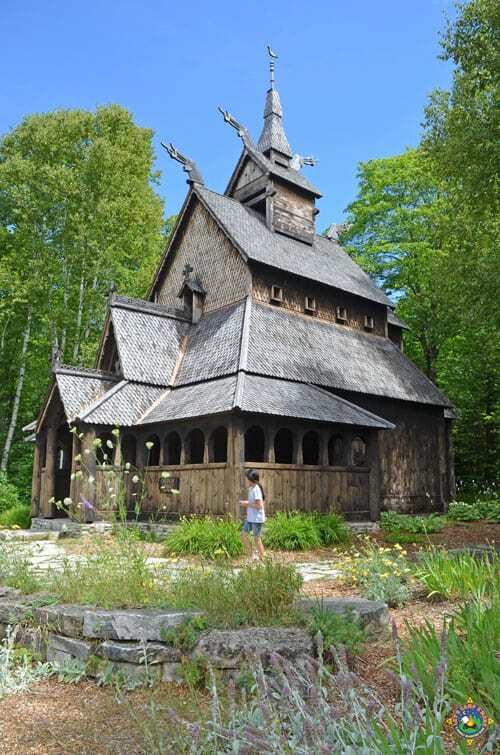 We wondered if we could find a spot that had the piney refreshment of the Northwoods, but also the warmth of a sandy beach–and maybe an ice cream cone or nice dinner it to go with it. 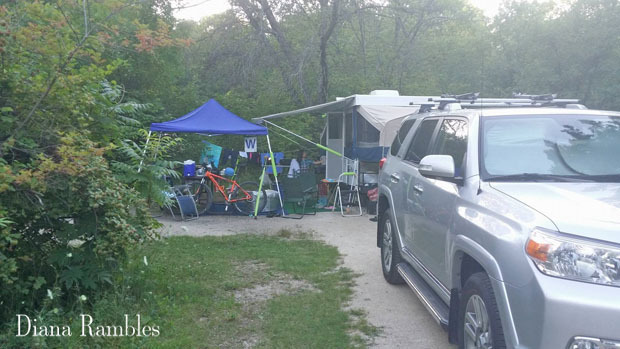 Believe it or not, we did find a camping destination that offers a nice balance of natural beauty and relaxing amenities– Peninsula State Park (PSP) in Door County Wisconsin. 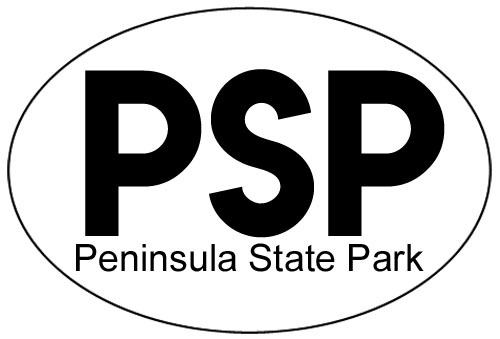 While it’s tough to get reservations in the busy season, and the surroundings sometimes seem tired—the great neighbors, natural beauty and a pleasant variety of activities offered at Peninsula State Park (PSP) have made it our go-to family campground. Pros: Why start a review of a campground talking about people? Simple. Camping neighbors can make or break a trip. A person reviewing a different, private Wisconsin campground (NOT PSP) wrote of that park, “There were tons of drunk adults roaming the campground. I wouldn’t even let my 7th grade and 4th grader play on the playground by themselves because of how drunk people were.” So, bad neighbors = bad experience, period. We’ve camped Peninsula State Park about ten times, and we have found most of the other campers are family folks, too. It’s fun to see dads chopping wood, moms jogging with their teenage daughters chatting about school, or to see experienced camping families like our neighbors last summer do something new and cool like hanging hammocks up stepladder style. At PSP, if my toddler runs out of the tent naked, I get the “Been there, too, Buddy” smile from neighbors, and if I ever accidentally leave a wallet or cell phone in the tent, it’s there when I come back. One fact that may account for the quality of the campers is you have to reserve a spot months ahead of time. Right now, nine months out, there are only two spots left for the week we are staying next August. So, the fact one has to plan almost a year in advance to get a week-long stay at Peninsula during my week probably contributes to the overall quality and intentionality of the camping neighbors. Cons: Of course, families have their cons, as well. I have been woken up by other people’s kids rattling around their campsite or annoyed by a yappy dog or visited by the ranger because my family was playing a raucous card game too loud and too late. At the electric sites, people with giant campers sometimes annoyingly run their air conditioners or lights at night. And, Of course, non-family campers stay at the park, too, so not everyone smiles sympathetically when my child yowls about a dropped S’more. 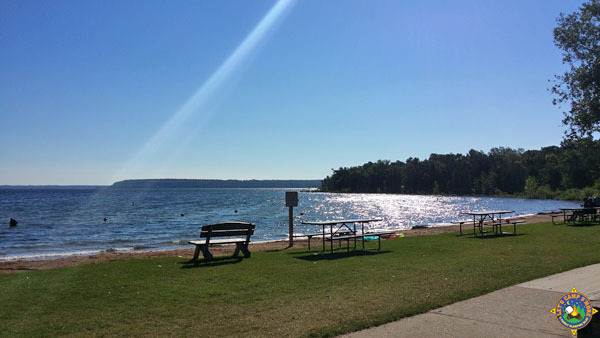 Last summer eight young adults were busted for underage drinking—a rarity in my experience at Peninsula State Park—but they were ticketed and gone by sunrise without so much as a bottle cap left behind. Finally, there’s a lot of money in Door County, so you might get a bit of yacht envy or catch a snooty look from someone with a wooden kayak (yours being the usual neon-green plastic). But, in general, the neighbors are forgiving, fun, family folks who usually make, not break, the fun at PSP. 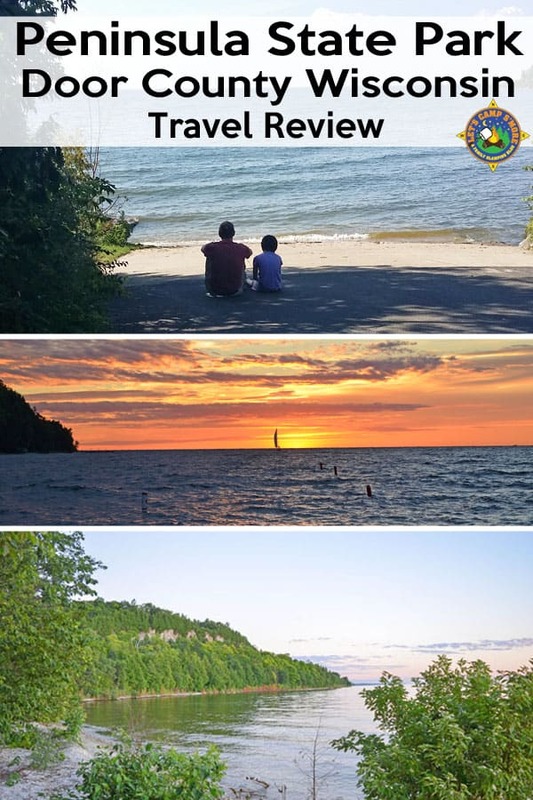 Pros: Our family drives 400 miles, over two days, to get to Peninsula State Park located in the northern tip of Door County, Wisconsin, so with that travel investment we want to experience nature. The park does offer some stunning, blufftop views of the lake, like this one on the right, of Strawberry Island in the bay. 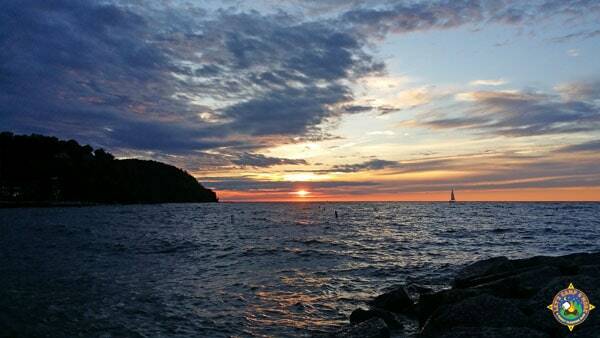 And, weather permitting, the sunsets are simply legendary. People gather nightly on the shores of Tennison Bay in PSP, to skip stones and gaze at often glorious sunsets. But, I find the park’s main natural charms more subtle and relaxing: The gentle sound of waves, the ever fresh cedar-scented lake breeze, quiet meadows with Queen Anne’s lace and black-eyed Susans soaking the sun. I have never seen a bear or deer in the park. But, I have seen pileated woodpeckers, chattery red squirrels, and once a salamander—little things I don’t get at home. 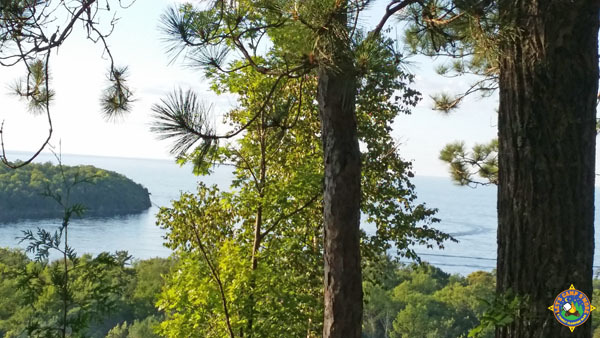 Whenever I enter the park and drive the meandering ten minutes to my camp spot–catching glistening views of lake Michigan between pine trees–I know I am just minutes away from quaint lakeside restaurants and wine shops, but I feel a world apart. Cons: The main con is that this park is popular and therefore crowded, and Mother Nature shows the strain of human activity. 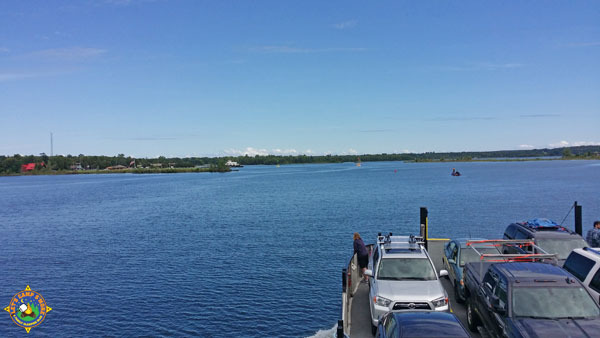 I was dismayed when, about two years ago, the DNR posted a warning advisory that the water at Nicolet Bay (PSP’s swim beach) had elevated bacteria levels. A contact with the DNR explained that, through a federal grant, researchers monitor many of the beaches statewide, so elevated e-Coli levels are probably not a just PSP problem—but a sad, widespread reality. 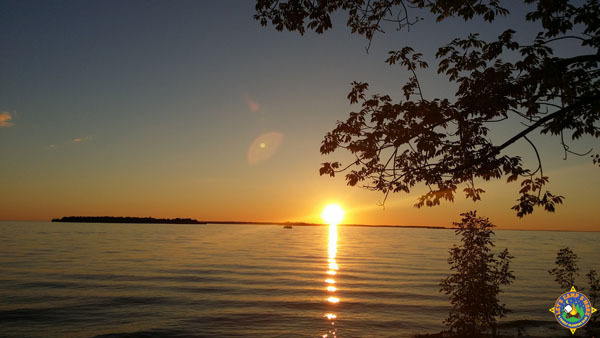 A DNR Web Data based noted that in summer of 2016 Nicolet Bay in PSP had five warning advisories and three beach closings (for an undisclosed amount of time). Moreover, sometimes the campsites seem similarly tired. The feel and appearance of campsites varies greatly depending on the location in the park one picks. We almost always stay at Tennison Bay Campground, one of six different campsites in Peninsula State Park. Tall, green needled pine trees sheltered the area where we stayed offering that distinctive pine scent, some soft ground coverage of crunchy brown, pine needles, but also some perplexing mounds of tree branches here and there. The Department of Natural Resources had recently thinned the pine area, which meant they lopped small pine trees down and trimmed overhanging branches, leaving the trunks bare for about twenty feet. The trees looked thin, some even sickly, with their remaining green branches far overhead and dead brown branches in piles below. To be sure, you could still breathe the piney air, gaze at the moon, hear the whispering pines—but the tree thinning made me feel I was camping in a backyard after a big windstorm. A DNR contact explained that leaving the piles of sticks on the ground naturally revitalizes the ground and that by the end of the summer campers used most of the extra wood for fires. In fairness, I have camped at probably a dozen different state and national parks, and the trampled tiredness of a campsite—even when clean and well maintained, like PSP’s—is very common. For me, little pleasures like campfire S’mores or the sound of the wind in trees make camping worthwhile. My wife and I relish that Peninsula State Park provides so many natural pleasures along with some special luxuries in the nearby, quaint lakeside towns–like a scrumptious fresh fish dinner (followed by the famous Door County cherry pie), or a fresh tossed unique pizza at restaurant owned by a Swedish trained chef, or a homemade ice cream cone along with a window-shopping stroll by artsy shops; a movie at the nearby drive-in theatre; a game of miniature golf (yes, mini-golf, but Door County has managed to keep things local and quaint); a professional, rollicking-but-family-friendly play held in a beautiful outdoor theatre in the park; or taking a ferry to explore nearby Washington Island with its preserved, old family farms and interesting Nordic culture (including a Nordic church called a slavkirke, built by Viking ancestors in the traditional way to resemble—what else—a Viking ship!). I have learned to enjoy the extras camping in a park near tasteful, but busy little lakeside towns. But, my heart is truly with the simple pleasures of the park itself. Swimming in fresh water by a sandy beach in Nicolet Bay followed by a delicious twist cone (my those Wisconsin people do ice cream right! ); walking in the early morning through sun-dappled woods to a century old, real lighthouse, overlooking the lake, quietly skimming the waves for an hour or so on kayaks. All these experiences are great, but my favorite PSP simple pleasure is bike riding. 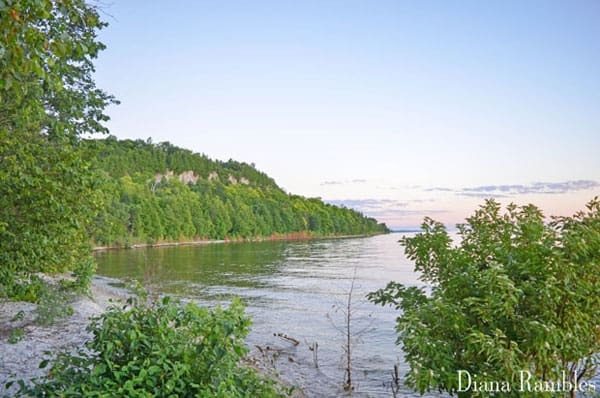 Four-to-six feet wide, white crushed rock trails, gently roll throughout fragrant cedars along the Lake Michigan Coastline all throughout the park. I love that a person doesn’t need a car to get to the beach or the theatre or the nature center—or just to ride slowly past a quiet meadow. Now, there are paved roads allowing people to drive most places as well, but, why drive when you can bike hearing the gentle crunch of the gravel, the whoosh of the waves on the shore, and feel the cool air through your hair? The queen trail is the aptly-named 10-mile “Sunset Trail” which loops the park and—I can say without exaggeration—provides breathtaking views of orange, red, purple sunsets. Cons: The bike paths are gravel, and my wife once took a hand-skinning spill, and kids and spandex hipster adults riding fast don’t always mix well. More importantly, though, because most of the pleasures are simple, this—our tenth family camping—I began to worry that my growing kids might get bored with making sandcastles or biking past the same flowers in the same meadow. I looked into some flashier nearby attractions like a tree-top zipline or a kayak tour—but, the fact is, this is not Yosemite or Yellow Stone. There are no breathtaking mountains to climb or wild buffaloes or bears or even moose. Thrill seekers might find the place predictable. But, that’s what I love about Door County. It. Never. Changes. And I wouldn’t want it to. Thank you for providing this review, Steve. We have to agree that the best part of Peninsula State Park is the bike riding. We can’t wait to hit the Sunset Trail and see a play when we go in August. Maybe we will cross paths in PSP. Check out our review of Wyalusing State Park in Wisconsin.